Dr. Lori Wiest is a professor of music at Washington State University Pullman, where she is also director of Choral Activities and conductor of the WSU Concert Choir and Madrigal Chamber Singers. She teaches graduate courses in Choral History/Literature and Choral Conducting and is associate dean of the College of Arts and Sciences. She served the University as associate dean of the WSU Graduate School for eight years and interim chair of the Department of Foreign Languages and Cultures for two years. Dr. Wiest completed the leadership role of president of Washington American Choral Directors Association in the summer of 2013 and assumed the role of vice president (2013-2015). Prior to joining the faculty at WSU, Dr. Wiest taught Music Theory at Mesa Community College in Arizona and at the University of Arizona and served as conductor of the Spokane Symphony Chorale for 12 years. Dr. Wiest received the Doctor of Musical Arts Degree in Choral Conducting and Music Theory from the University of Arizona in 1990, the Master of Music Degree in Choral Music from Arizona State University in 1986, and the Bachelor of Science Degree in Music Education and Piano Performance from North Dakota State University in 1984. She has sung with conductors Robert Shaw, Charles Dutoit, Maurice Skones, Douglas McEwen, and Edwin Fissinger. As the recipient of a generous grant from the National Endowment for the Arts in support of American Choral Music, Dr. Wiest invited international composer Eric Whitacre to WSU to conduct a concert of his compositions with the Concert Choir and Madrigal Singers. She also has worked with and performed music by other well-known contemporary composers, including John Corigliano, Morten Lauridsen, Chen Yi, and Libby Larsen. The WSU Concert Choir and Madrigal Chamber Singers, both under her direction, have been invited to perform for the Washington Music Educators Association and recently performed in South Korea, in Austria as choir-in-residence for the Classical Music Festival in Eisenstadt, and in St. Petersburg, Russia. The Madrigal Chamber Singers—who also traveled to Italy in March 1998 for a performance tour that included singing at St. Peter’s Basilica in Rome and the Florence Duomo—tour annually in the spring semester, often performing throughout the state of Washington and extending to various other states. The singers presented a featured performance at the Arizona Renaissance Festival in 2000. The Concert Choir is the premiere choral ensemble at WSU and, in addition to their recent tour of South Korea, Austria, and Russia, they have performed in the Czech Republic, Hungary, Germany, at Lincoln Center in New York, and Benaroya Hall in Seattle. They have been featured performers with the Spokane Symphony and the Washington-Idaho Symphony, as well as actively performing at WSU and within the state of Washington. Dr. Wiest is active as an adjudicator, clinician, and guest conductor, including All-State and Honor Choirs in Florida, New Mexico, Idaho, Montana, Oregon, and Washington. She was adjudicator and clinician at the Australian International Music Festival and led a tour of student musicians to Germany, allowing the students to attend concerts and meet with musicians working in Germany for a closer look at the professional lives of performers. In 1999, she was the choral conductor and clinician of the Pacific Basin Music Festival in Hawaii. She has been invited to present at professional conferences of Northwest American Choral Directors Association, Washington American Choral Directors Summer Institute, Washington ArtsTime Conference, College Music Society Regional Meeting, Rocky Mountain Modern Language Association, Northwest and Washington Music Educators Associations, and MENC National Biennial In-Service Conferences. She was the organizer and facilitator of the ACDA National Conducting Awards and Choral Conversations presentations in 2003 and 2005 at the national conventions. An article titled “Techniques for Vocal Health,” authored by Dr. Wiest, was published in the February 1997 issue of Teaching Music, a publication of MENC. Additional articles by Dr. Wiest have been published in ACDA’s refereed journal, The Choral Journal. Her recent awards include the William F. Mullen Excellence in Undergraduate Teaching; the College of Liberal Arts Distinguished Contribution Award; and the 2016 Washington ACDA Leadership and Service Award. At WSU, Dr. Wiest has been a member of the WSU Showcase Committee, Professional Education Advisory Board, WSU Faculty Senate, Student Affairs Committee, and Faculty Status Committee. She was coordinator of the WSU Individual Interdisciplinary Doctoral Program. She actively serves on internal committees such as Faculty Advisory Committee, Music Curriculum Committee, Scholarship Committee, and various Search committees. 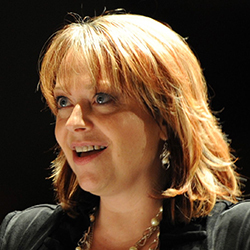 Her active membership in professional organizations includes American Choral Directors Association, National Association of Music Educators, National Association of Teachers of Singing, and College Music Society. Dr. Wiest served as the National Chair of Youth and Student Activities Committee for the American Choral Directors Association and the editor of The Student Times, a section in the ACDA refereed journal. As a featured soloist, Dr. Wiest has performed with the Washington-Idaho Symphony and the WSU Concert Choir. She was a member of the Robert Shaw Festival Singers and has also performed as a soloist in Austria, Italy, Switzerland, and Germany and was featured on Northwest Public Radio.